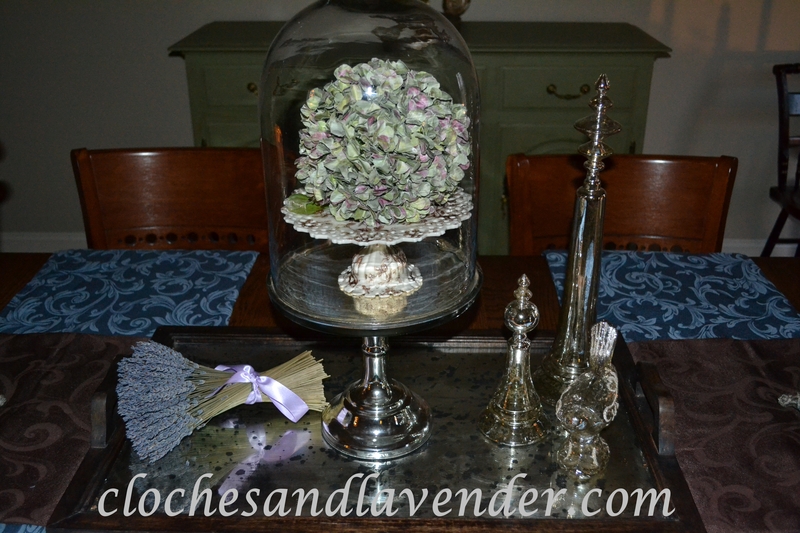 I took down the Easter items from the dining room table today and needed something to go under the cloche. 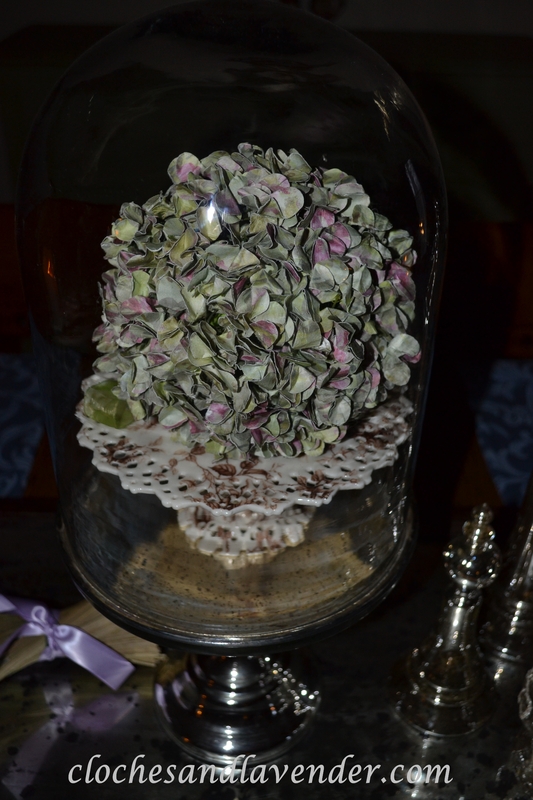 I had purchased this hydrangea ball from www.elizabethsembellishments.com a week or 2 ago and just decided that it would look so pretty under my favorite cloche in the center of the table scape. It is a perfect fit and I think I will leave it there through the summer. I believe it adds so much elegance and beauty to my cloche. Lovely hydrangea! I love the colors! I love the hydrangea under the cloche. I’m anxiously awaiting for my hydrangea to bloom. I love your Hydrangea ball! It’s gorgeous under the cloche! Your tablescape is lovely and perfect for summer! I’m going to check out the Hydrangea ball now; thanks for the link! So pretty! I love hydrangeas. How very very pretty! Thanx for coming to THT! I’ve nominated you for the Sunshine award! Please visit my blog to follow the instructions. Very pretty! Thank you for joining me at Home Sweet Home! Nice decor! 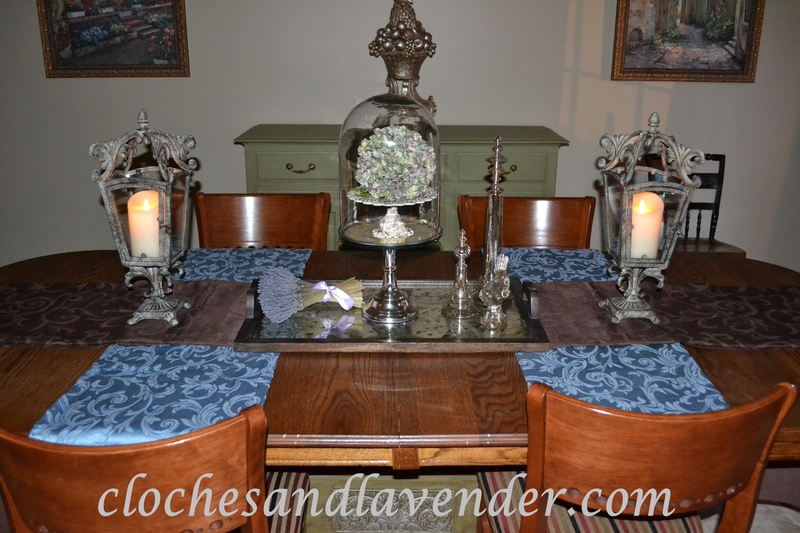 Can you tell me about the candlesticks/lanterns on the dining room table? I bought them from Pottery Barn. They still sell them.